Francis Cauffman designs a medical facility for the University of Rochester that unites research with practice. 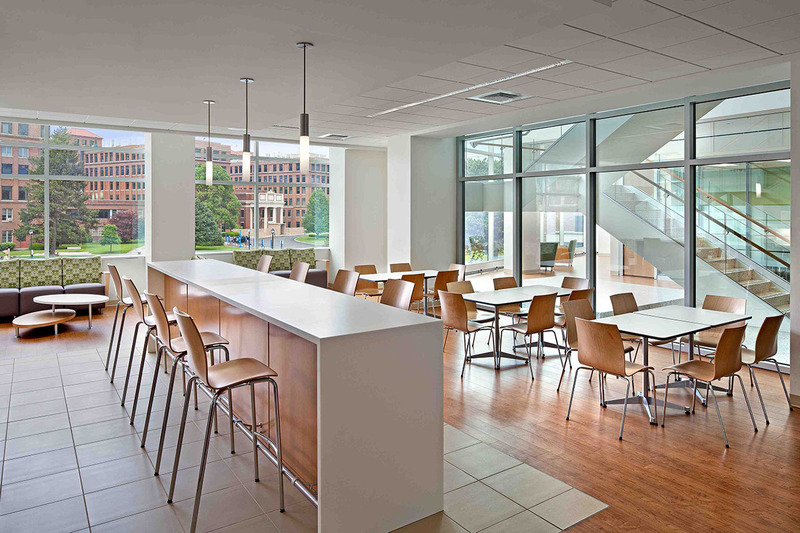 This first article in a three-part series on the University of Rochester’s Clinical and Translational Science Building provides an overview of the workplace strategies Francis Cauffman used to integrate the 11 diverse departments of the Clinical and Translational Science Institute under one roof. Follow Buildipedia throughout the month of May to learn more about the engineering details of the building and how it achieved LEED Gold certification. The University of Rochester’s 200,000-square-foot Clinical and Translational Science Building (CTSB, also known as the Saunders Research Building) in Rochester, NY, was developed with one goal in mind: to foster communication among researchers and clinicians, thereby shortening the lifecycle by which breakthrough medical discoveries evolve into approved, accessible treatments. The project stemmed from an initiative by the National Institutes of Health (NIH) to advance translational science, which focuses on integrating the understanding, education, and treatment of disease. 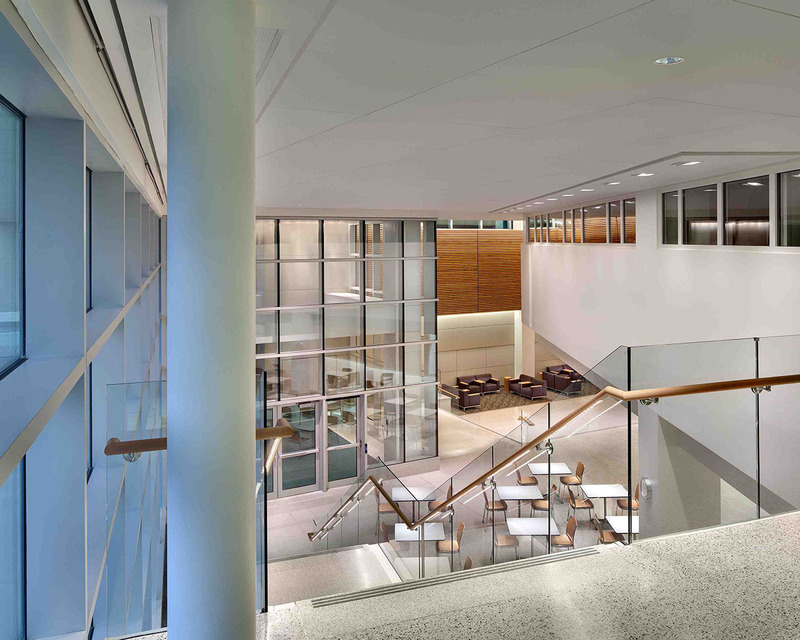 As the recipient of an NIH Institutional Clinical and Translational Science Award, the University of Rochester’s Clinical and Translational Science Institute hired Francis Cauffman to unite its various departments in one building and help to bring its collaborative workplace vision to life through architectural design. 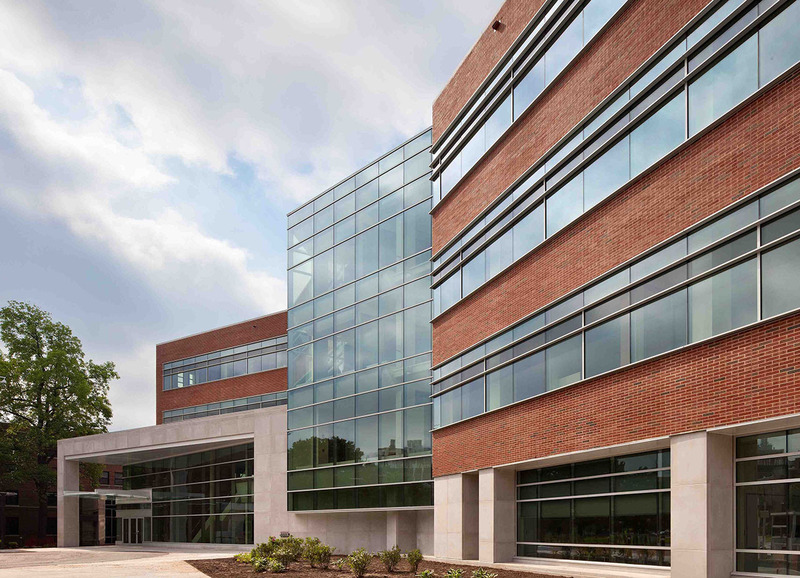 After studying the workplace behavior and specific needs of the diverse departments that comprise the Clinical and Translational Science Institute, Francis Cauffman designed the Clinical and Translational Science Building (CTSB), the first building of its kind in the field of translational science. “Our goal was to create an environment that would encourage collaboration – in order to get treatments to patients in the shortest, most efficient time frame,” says Campbell. Located on the medical campus of the University of Rochester, the CTSB anchors the medical buildings on the established north side of the campus and bridges to new developments taking place on the south side of the property. “The CTSB is now the flagship of the property, and its public atrium is being utilized daily by those walking throughout the medical complex,” says Campbell. According to Campbell, the atrium lobby on the main level of the CTSB is the heart of the building. In addition to providing a convenient, open-to-the-public route through the medical center, it was carefully designed as a multi-use space to accommodate large functions, student presentations, community awareness events, and even formal dinners. 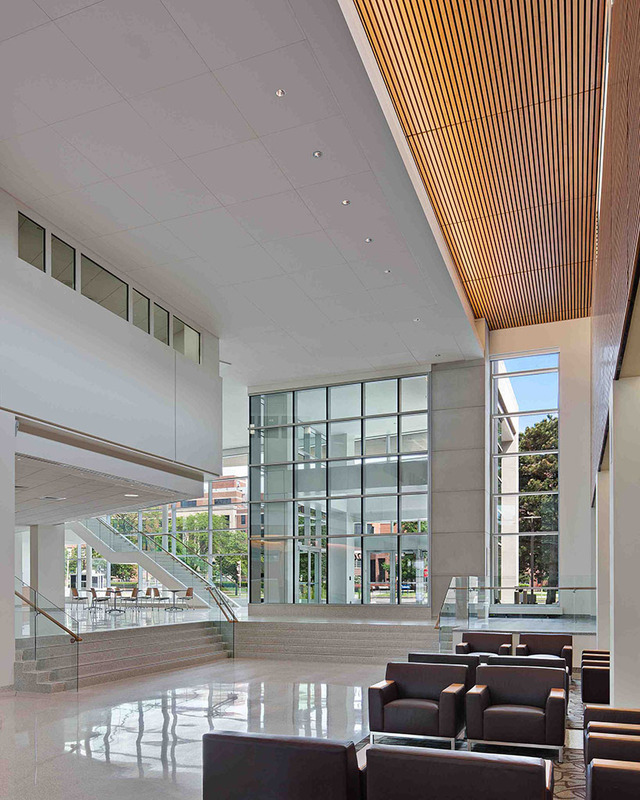 In addition to the atrium lobby, the main level also features the offices of the Clinical and Translational Science Institute, a Clinical Trial Suite with exam rooms and medical testing facilities, and several meeting rooms that are being used for undergraduate and graduate studies, as well as community outreach programs. The next three levels of the CTSB house the Clinical and Translational Science Institute’s remaining departments: the Clinical Trials Coordination Center, Cancer Control Studies, Community and Preventive Medicine, Pediatric Clinical Research, the Center for Community Health, the Department of BioStatistics and Computational Medicine, and the Department of BioMedical Informatics. The basement of the building houses a fitness center for employee use. To further encourage interaction throughout the building, break rooms and conference rooms were placed near the staircase landings on each floor. The break rooms feature a coffee area, as well as bistro and lunch seating where staff can congregate. Designed with social interaction and relaxation in mind, the large glass walls of the break rooms offer natural light and exterior views. Although Francis Cauffman’s strategic approach to workplace design is consistent from project to project, Campbell explains that this project was especially interesting because of the lack of existing examples in the academic realm when it comes to inverting offices from the perimeter to the core and opening up workspaces. “We had to really define this idea of collaboration as it relates to the specific needs of academic research,” he says. Lisa Taylor is a freelance writer and marketing consultant. She has more than 16 years of experience as a communications professional and has worked with a variety of companies in the home products and building materials industry. Originally from Memphis, TN, Lisa earned a BA in Journalism from the University of Memphis in 1995 and a MA in Journalism from the University of Memphis in 1997. She spent the first 11 years of her career working in account service for Memphis advertising agencies Thompson & Company, Oden Marketing & Design, and Carpenter/Sullivan. Lisa then spent five years in Nashville, TN, with The Buntin Group, an Adweek Top 100 U.S. advertising agency, and Louisiana-Pacific Corporation, a leading manufacturer of building materials. Lisa currently lives in Denver, CO, and is Principal/Owner of Wazee Marketing.